When it comes to wisdom, there is no neutrality. In a time when self-help is the world’s version of the Gospel, how can we truly know how to “help” ourselves? 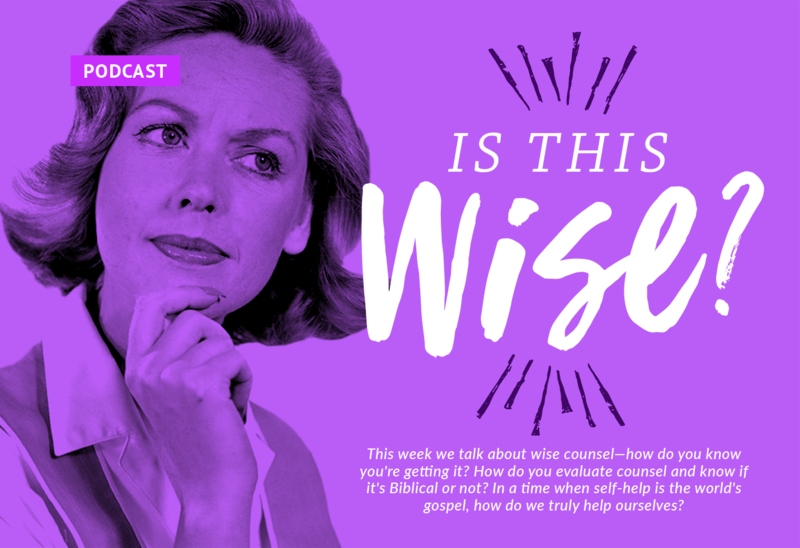 How can we differentiate between wise counsel and foolish counsel? What do we do when we want to give good counsel, but we aren’t sure what that looks like? 5:00 Joy admits to an irrational fear she is guilty of. Then Summer does the same. And it gets awkward. 10:00 If the world ever gets wisdom right, it’s because it is in alignment with God’s word. 16:05 Do we sound like a broken record? That’s fine, we’ll say it again! The local church body functioning as God has designed it is instrumental in growing in wisdom. 17:00 Being a believer who knows the Scriptures well is a way to love others, because it equips you to give them godly counsel to others. 19:00 The Apostle Paul makes it clear that there is no neutrality when it comes to what is wise and what is foolishness. 22:15 So, does that mean that if someone comes to you for counsel, you can only repeat Bible verses? 25:45 Sometimes accepting wise counsel is going to require a good dose of humility. The first 6 minutes are just inane and super annoying. I really want to hear something thoughtful & worthwhile, especially at the outset… but it was just giggling and randomness. Can we have an intro that is to the point? Please? Hi Christina! So many people cannot stand that we don’t just get straight to the point. Sounds like you’re one of them! But, more people actually like feeling like they are listening in on a conversation with us, and we enjoy making conversation, so we won’t be changing. On most podcast players, they give you an option called “fast forward” that you are free to use. I even create timestamps on the episode page so you can know exactly what mark to fast forward to. Hope that helps!